This retreat is an opportunity to spend time in deep silence and inquiry with Amoda Maa. By gathering together and turning away from daily activities, you are supported in the ever-deepening realization of silent being. From this inner sanctuary of silence you are invited to tell the truth without the habitual narrative of story-telling, allowing questions to arise spontaneously from simplicity and answers to arise in clarity. The daily schedule will include periods of Silent Sitting, Talks, and Inquiry (Q&A) Sessions. 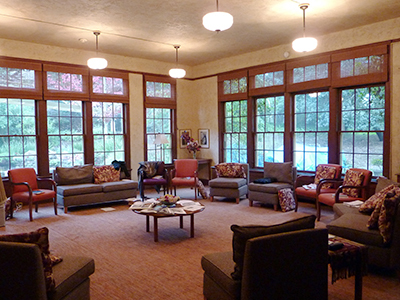 The retreat is held throughout in a container of conversational silence (no talking or interaction outside of the Inquiry Sessions, and no social conversation at meal-times or during breaks), mind and heart are given the possibility of coming home to their deepest longing. This is a residential retreat (accommodation and full meals included). But for those who live close by, we also welcome commuters (no accommodation, with or without meals). The special atmosphere of privacy and quietude provided by the venue supports commuters to enter silence as soon as they arrive each day. See below for full info about accommodation & meals. Please note - if you are attending as a commuter, you are required to attend all the sessions. Sessions start immediately after breakfast (breakfast is served 8-9am) and continue after dinner (dinner is served 6-7pm) up until about 8 or 8.30pm. If you choose the "no meals" option, we request you bring your own lunch & dinner so that you can stay within the sanctuary of the center. Held at Santa Sabina Center - a unique sanctuary in Marin County, just 30 minutes from San Francisco. The center was originally built as part of the Dominican monastic order, and continues to have a quiet elegance and sacredness that supports contemplation and meditation despite its proximity to the urban environment. There are woods close by, as well as many quiet streets around the Dominican University campus. There are also plenty of places to sit privately, either indoors or outdoors in the beautiful gardens. Accommodations are single or double rooms (twin beds). Rooms are simple but elegant and comfortable - all bedding and towels are provided. Bathrooms are shared (men & women separate) and are conveniently located in the common hallways. Meals - 3 full meals are provided daily, with teas, coffee & hot water/lemon available throughout the day. All food (non-vegetarian, includes dairy, sustainably-raised salmon and free-range chicken) is locally-sourced, organic whenever possible and deliciously healthy. Special dietary requests (such as vegetarian/vegan/gluten and dairy free) can be catered for. How to get there - If you are driving, the center is easily accessible from either north or south Highway 101. The center is 60 minutes from the San Francisco International Airport; the Marin Airporter to San Rafael and a short taxi-ride are available. More info about location here. (You will be sent more complete travel instructions and transportation options after reserving your place). Lodging (accommodation + meals) is additional. Full cost (Tuition + Accommodation + Meals) for Single Room, Double Room, and Commuter options is shown in the Ticket prices below. Cancellation policy - Prior to May 1st, full refund minus $75 administration charge. After May 1st and up to May 23rd, 50% refund. After May 23rd, no refunds are possible. Contact - for questions about this retreat, reserving your place, or assistance with travel, please email us here.